You walk by her every day in the hallways, but how much do you really know about her? This senior, Cristina Ricco, is the perfect example of the ideal IHA girl. 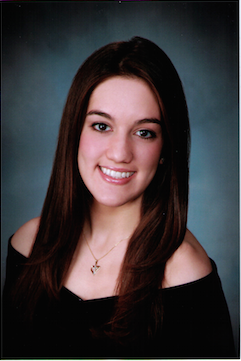 Cristina has been an active member in the IHA community since she walked in as a freshman. She is currently in National Honors Society and National Spanish Honors Society. She is a peer mentor and a group leader for the Spectrum for Living. Cristina is an active member of student council, photography club, math and science league, and the Christian Service Board. Cristina also has great talents outside of school. She is on a competitive dance team and has been dancing since she was only three years old. Cristina is also a dedicated piano player. She spends a lot of her time volunteering at Valley Hospital and at the Spectrum for Living. Although Cristina takes part in many extra-curricular activities, none of these activities have stopped Cristina from pursuing her academic career. Cristina has taken extremely stimulating classes during her time at IHA and has never been afraid of a challenge. During her junior and senior years, Cristina took AP Chemistry, AP Spanish, AP Calculus, and AP Biology. All of Cristina’s other classes were at the honors level. “Cristina has been a great friend these past four years! I know I can count on her whenever I need, even for the smallest thing,” said Sarah Cherian, a good friend of Cristina’s. Cristina plans on studying Neuroscience at Johns Hopkins University in a pre-med track. We know she will make IHA very proud and the IHA community wishes her all the best!